If you're looking for your own private patch of paradise, and maybe even the opportunity to reconnect with nature without roughing it, make Imanta, Punta Mita your first stop. As you step out of your air-conditioned car and into the hot Mexican air, your first thought will be, 'How soon can I change into my bikini and dive into that view?' As the sparkling blue waves lap the white sandy beach in the background, the rest of the resort is enveloped in lush, green jungle with mesmerising mountain views. Founded on the concept of natural beauty and environmentally sensitive architecture, the resort has just 12 sumptuous lodges (or casas). On arrival you'll be welcomed with homemade nachos and guacamole, and in the evenings, you'll be lulled to sleep by the gentle lapping of the Pacific and sounds of the jungle. Each suite opens out on to its own veranda, most of which have a private pool, marshmallow-like day beds and sea views to boot. Choose the exclusive Treehouse Suite and you'll be completely secluded with your own private beach and natural spring pool. With such seclusion and undisturbed beauty at its core, it's easy to see why Imanta has been a hit with Hollywood's elite, including Gwyneth Paltrow, and celebrities such as Christina Aguilera, who got engaged there. The al fresco restaurant serves delectable authentic Mexican dishes, with the catch of the day sourced that morning from the local fish market – foodie couples can even visit the stalls with the head chef to choose their favourite seafood. If shrimp is on the menu, it's a must-try – not to mention premium cuts of meat and local, organic vegetables. Start the day right with eggs – Mexican-style – served with corn tortillas, pulled chicken, green or red tomato salsa, cheese, peppers and refried beans (also known as Chilaquiles) and end it the only way possible, on a roof top bar under the stars, heady cucumber margarita in hand. You won't find a better spot to watch Riviera Nayarit's famous sunsets. Max your stay: Visit during turtle season (June to November) and you can help with the newborn sea turtle release ceremony on the beach at sunset. It's a magical experience and one you're not likely to forget in your lifetime. If you want to break up your trip with a little activity, the combination of luxury accommodation and adrenalin-fuelled activity at the St Regis Punta Mita is hard to beat. With a charming suite no more than a few lazy steps from the beach and a personal butler so accessible you can contact him via Whatsapp, you'll want for nothing here. During check-in, the warmest of welcomes and a chilled local cocktail sets the tone for the extravagance that lies ahead of your stay. The resort has 120 private guest rooms, each with a garden, ocean or beach-front view, located in more than 22 acres. Inside, the rooms are crammed with an eclectic collection of river stone, marble and wood furnishings, combining traditional Mexican art and décor with a touch of modern Provence. 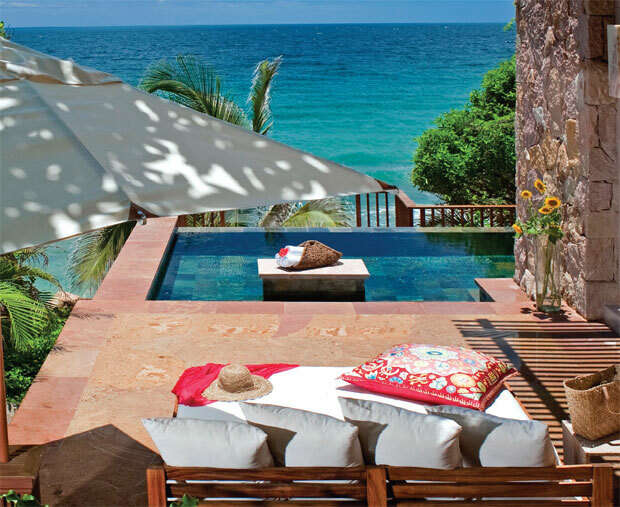 Choose a luxury suite and you'll even have your own outdoor plunge pool. Should you want to get out and about, there's plenty for active couples to do on-site, including two championship golf courses, tennis courts, a fitness centre and beach-side yoga. But if you're keen to explore, take advantage of the activities on offer from Punta Mita Expeditions (www. puntamitaexpeditions.com) and make the renowned Hidden Beach your first stop with a boat trip to the Merieta Islands. The beach is only accessible by swimming through a 50ft cave, while the islands are home to an abundance of fish and bird species. It's also the perfect opportunity to try your hand at paddle-boarding and snorkelling. Feeling lazy? Book yourself into the tranquil Remède Spa for a treatment or two (the signature massages come highly recommended) and cosy up beneath a shady canopy in the relaxation gardens. When it comes to gourmet cuisine, everything you'd expect from a traditional Mexican resort is here, from a light lunch of lobster tacos at Mita Mary on the beach, with the sand between your toes, to a relaxed evening meal together at Sea Breeze. Talk tequila with the bar staff and sample the delicious cocktails in the beachside bar, or, if you fancy getting out for the evening, the Four Seasons Punta Mita (www.fourseasons.com/puntamita) is just a short taxi drive away and makes a great alternative for dinner and tequila tastings during your holiday. 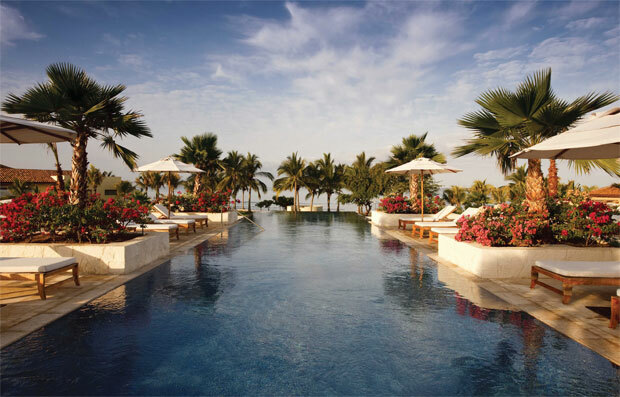 Max your stay: The hotel can cater to your every whim when it comes to exploring the surrounding area of Punta Mita, whether it’s shopping for Mexican handicrafts in the local markets, fishing or venturing out to marvel at the majestic humpback whales. Be sure to check with the concierge about what’s available. Stylish honeymoons don't get much better than this. 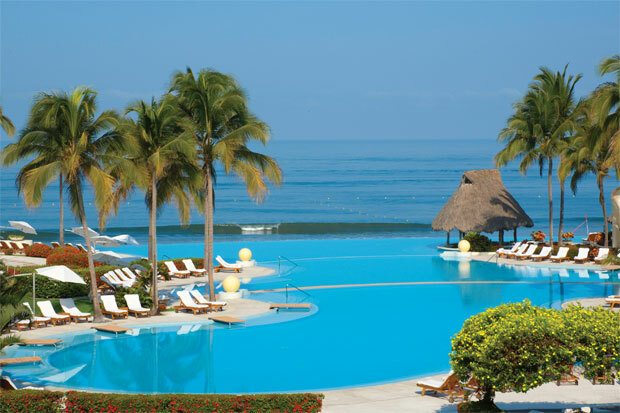 Just a 20-minute drive from Vallarta-Nayarit airport, the mega-luxe Grand Velas is an all-inclusive resort. Your honeymoon will start exactly as it should, with a few aphrodisiac nibbles and a chilled bottle of wine in your suite, as you peer over your balcony to the breathtaking view of the infinity pool and the blue waters of Banderas Bay beyond. The first thing you'll want to do after checking into your suite – complete with outrageously large bed and powdersoft pillows – is head straight down to the plush pools, where your waiter will hand you a strawberry daiquiri almost immediately. By day, flit between the pool and beach, and while away the hours enjoying pool games, propping up the swim-up bar or staring into the mesmerising horizon, budging only to have a light lunch at one of the on-site restaurants. The resort is big – 267 suites – but thanks to the super-slick service, it feels intimate. Every time you leave your room, the fridge is replenished (at no extra charge, of course) and the food fairies leave daily treats, including macarons and melt-in-the-mouth chocolate truffles. If you feel like exploring, the hotel can arrange for you to enjoy a range of watersports, including jet-skiing, paddle-boarding and diving, but the hotel's spa is also a must visit. Recently named as Conde Nast's 'Most Excellent Spa', it has a whole menu of pampering rituals to allow you to truly relax on your first holiday together as Mr and Mrs. The jewel in Grand Velas' crown is, without doubt, the fine dining options included in your stay. Frida will wow you with authentic Mexican cuisine, Luca offers hearty Italian dishes, and Piaf showcases a classic French menu with gentle live music and romantic, ambient candlelight. End your evening with an espresso martini - or three - in the lobby bar, or enjoy a hand-in-hand stroll along the moonlit beach before retreating back to your room. Bliss. Max your stay: If you can tear yourself away from your sun-lounger, head to the vibrant beachfront town Sayulita in a taxi to buy your souvenirs. Packed with crafty, hipster shops, cool bars and some world-class surfing spots, the town is infectious, with a heady mix of animated streets and traditional Mexican architecture.